Nexus Property Management™ provides the RENT4U® service to Owners who are in search of strictly tenants, and not ongoing management. We have an evolving pool of potential tenants in search of properties to rent; from studio apartments to oceanfront homes. In conjunction with our industry leading leasing speed, your unit can be producing cash flow with an owner approved tenant before you know it! 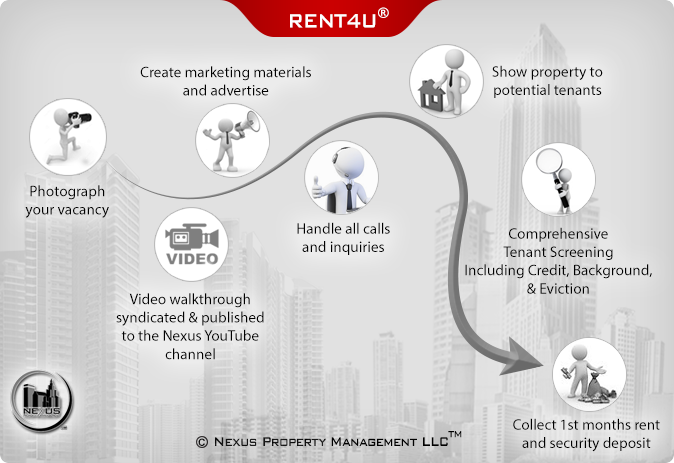 The RENT4U® service is a program offered to owners that want to take advantage of Nexus’ superb marketing and tenant placement processes, but still handle the daily operations of the residence after it has be rented. Substantive background & rental history investigation that includes Credit, Criminal, Identity, Legal, Eviction, and Terrorist. After an owner approved tenant is located, Nexus will generate a customized lease (and related documents) and take care of the signing with your new tenant(s)! No other fees or binding contract! *Re-rental cost for a managed property is ½ month’s rent or $450, whichever is greater.